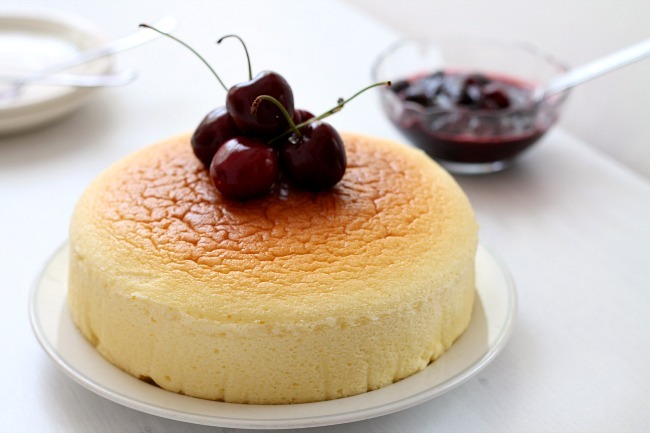 my bare cupboard: Japanese cheesecake with simple cherry sauce "
This is a lightened up version but just as delectable as its rich and creamy cousin . * In a medium bowl , combine the cream cheese , sugar , butter and cream . Put bowl over a pan of barely simmering water , whisk the mixture until smooth , let cool . * Preheat oven to 150°C . Lightly butter a 7-inch loose-bottom pan , line the bottom and sides with parchment paper , lightly butter the paper as well . * Beat yolks , add to the cream cheese mixture ; add in lemon juice and rum , mix until well combined . Sift in the cake flour in two additions , mix well until smooth . * In a large bowl , beat egg whites and add sugar in 3 additions . Beat until soft peaks form . Add about 1/3 of the egg white mixture to the cream cheese mixture , mix well then pour the mixture back into the bowl with the remaining egg whites . Fold the mixture well . * Pour batter into the prepared pan and tap pan on counter to remove air bubbles . * Bake in a water bath at 150°C for 30 minutes then lower to 140°C and bake for another 30 to 40 minutes or until skewer inserted in the middle of the cake comes out clean . If the cake begins to brown on top , cover loosely with foil . Let rest in the oven with the oven door slightly open , about 30 minutes . Let cake cool completely before removing from the pan . Glaze with apricot jam , if prefer . * In a small saucepan , combine 150 grams frozen cherries , 2 teaspoons brown sugar and 2 teaspoons water ; simmer over medium-high heat ,stirring from time to time until cherries are soft . Add 1 tablespoon of cherry jam , stir until dissolved , squeeze in some lemon juice , cook until mixture slightly thickened . Transfer to a small bowl , let cool and put in the fridge to chill . Makes about 1/2 cup . Your cheesecake looks so fluffy and soft! Actually the wrinkled top looks kinda nice, with lovely shades of golden brown in the center and lighter shade at the sides! Lovely! And serving it with cherry sauce looks so good! Thank you for baking along with us, hope you have a delicious wonderful weekend! good evening anne, any difference in texture compared to the previous one you made with milk? It looks great here especially with the cherry sauce, very inviting photos ! wow! Very nice! I find it hard go get a smooth top without cracks...still need to get to know my oven! Oh Anne, this looks incredible! I'm used to the heavy dense cheesecake which I love - but this looks SO delicious - going to have to make it!! 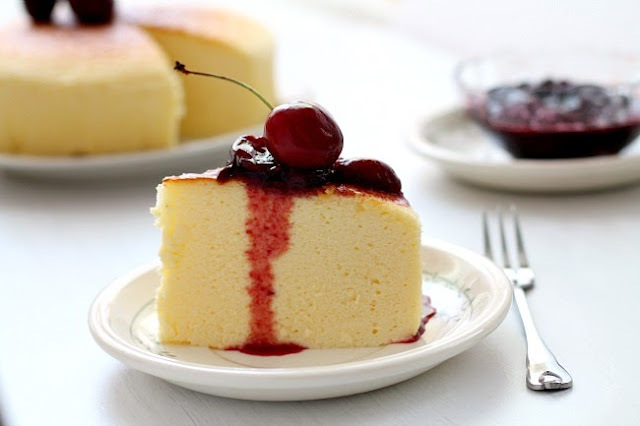 I wish to take the cheesecake from the 1st picture, and eat it straight away..with the cherry sauce, it sound really good! This is perfect bake! Hope you are having a great weekend, Anne :) Light or heavy, love them both ways, the only difference for me is heavy comes with a heavier guilt :)) Yours look so beautifully baked! Sino ang imo guests sa imo tea party? ngayo ko bi! Oh, I love the beautiful texture of this Japanese cheesecake...it's so perfect paired with a cherry sauce. I hope you saved me a slice, Anne! Anne, light cheesecake with cherry compote - totally fancy and what a treat :) makes a beautiful photo too. Great job - i definitely have to try this one day. Looks stunning! I prefer soft light cheesecake to heavy NY cheesecake. Yum! Of course I will choose the soft chiffon one. So what makes the texture so soft? Is it cream cheese? With cherry sauce it looks so good. Ooh, yum! I don't know which one I would pick as my favorite, I have never tried such a soft and fluffy cheesecake before. This looks like a delicious version, I should try it sometime! I laughed reading your description of your cake having a wrinkled top but a smooth baby bottom. Jokes aside, I think your cheesecake looks really good. 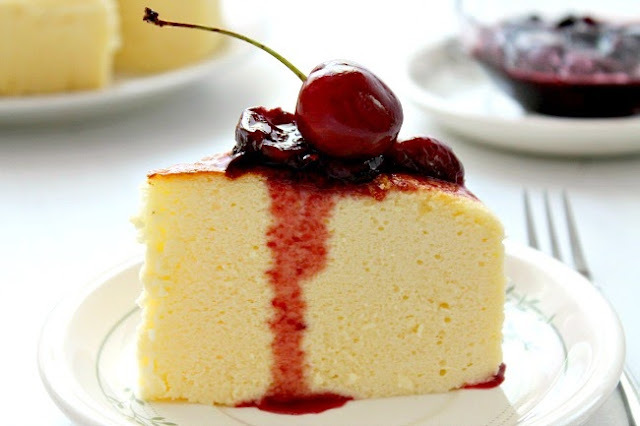 Nothing is prettier than your perfect slice of cake topped with a perfect cherry :D - Having said that, there is always some exceptions such as sunsets or sunrises or a Chanel bag - LOL! Your soft cheesecake turned out perfect! Love it with the cheery sauce, Anne. 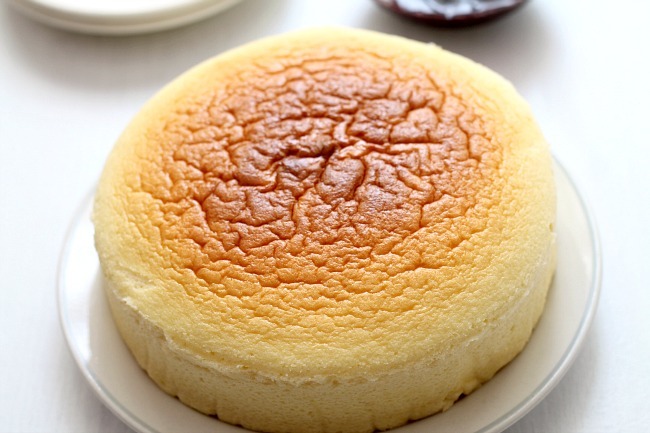 My vote goes to the Jap-style soft cheesecake as I always find the traditional version too rich for my liking. Yours looks just perfect like a baby's bottom! This is such a lovely cherry sauce Japanese cheesecake.